I've had numerous requests to screen this documentary at MF Social Club*, but I have to say I don't think it's going to happen. For me this is a question of legacy, who is responsible for telling this particular story and why - not just the story of A Tribe Called Quest, but a part of the story of hip hop. When I first started working in music, I had to begin to make a distinction between the artist and the person. I don't expect visual artist Chris Ofili to smear his bedroom walls with cow dung and glitter, or dancer Sylvie Guillem to go to sleep with her legs at a 180 degree angle in pointe shoes every night. So I had to stop being surprised when I heard stories about my adolescent heroes. "Conscious" rappers (an imposed label, generally not their own) in "real life", being rude and arrogant, treating women like a tongue in cheek Common skit, listening to Gucci Mane and Jeezy, fighting with each other, blowing all their money on cars, and generally being human - fallible. "Beats, Rhymes and Fights", which I imagine is a joke title, is ironic since it alludes to the album where apparently things began to fall apart for Tribe, or certainly Phife was starting to speak publicly about disagreements. However Beats, Rhymes and Life goes beyond being a Tribe album, and to a certain extent as a phrase it represents the best aspects of hip hop to many of us. "Life" was something ATCQ talked about in such an articulate, intelligent, honest and artistic fashion in a way so few have done successfully since, for that word to be replaced by "Fights" does them somewhat of a disservice. 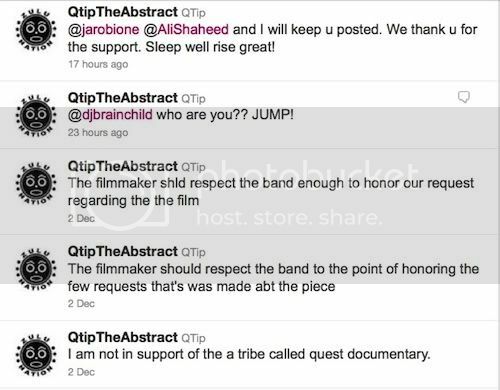 Phife Dawg has regularly aired his views publicly over the last 10 years, so Tribe fighting is not news to most fans - he even released a Q-Tip diss record (which no one bought and Q-Tip forgave). The point is the music was more important, almost no groups last forever, it's their legacy that lasts. I hope this documentary isn't a superficial sensationalist gossip vehicle, rather than an opportunity to focus on the true importance and impact of one of the greatest music groups of all time. *The MF Social Club is on hiatus at the moment.